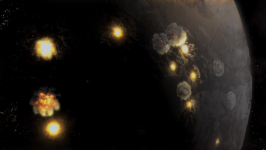 The Twelve Colonies on BSG are a star system with an amazingly improbable configuration which greatly damages the otherwise spectacular scientific realism of the series. (Use of "god" as a plot device notwithstanding...) The principal issue is that everything we know about the formation of planets tells us that the odds of even one Earth-like planet forming in a star system are highly improbable. Saul Tigh even confirms this fact on screen by stating in Water that most of the universe is a barren and desolate place. Thus, the idea that twelve such planets could exist within a single star system is simply ridiculous. Firefly suffered from this problem to an even greater degree. In Firefly, they rationalized it by claiming all the planets and moons within the star system were terraformed, but even with terraforming there is only so much physical space within a star system. For a planet to be habitable, it must be a certain distance from the sun. Not too close, but not too far either. That means all habitable planets within one star system must share very similar orbits in order to be habitable. So in addition to terraforming them they would have had to fundamentally recalibrate their orbits to cram them all into the star's habitable zone. This pushes suspension of disbelief well beyond the breaking point because the technology required to do that is clearly well beyond what the characters possess in both BSG and Firefly. How do we know all twelve colonies are all in one star system to begin with? It was originally stated in the series bible as well as on RDM's blog that all twelve colonies exist within one star system, in keeping with the original series. These off screen statements are not necessarily canon until they're explicitly stated on screen, but the vast majority of the television series confirms this statement by implying that this is the case in scenes here and there, however no direct statement of confirmation was ever made. In fact, a statement by the hybrid in The Plan seems to imply that the Twelve Colonies are three star systems. She referred to the attack on the colonies as "twelve battles" and "three stars." However, again, that statement is far from conclusive. And even if it were true, it doesn't help much because it would still cram four habitable planets into a single system which is less unrealistic, but still pretty bad. How do we know all twelve colonies are habitable? 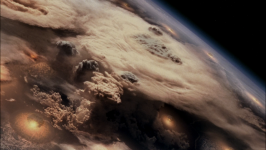 For a long time we didn't know for sure that any other colony besides Caprica was Earth-like because we hadn't seen any of the other colonies besides Caprica. We did see a photo taken on Aerilon early on, but it was too lacking in detail to be conclusive. For all we knew, all other eleven colonies were artificial life support domes constructed on barren, lifeless worlds. Sort of like Mars colony on Babylon 5. This would have been an acceptable level of realism. Caprica: seen throughout the series from orbit and on the ground. Always depicted as Earth-like. Tauron: seen from orbit and on the ground in Razor in Cain's flashbacks. Always depicted as Earth-like, except perhaps drier and more barren. Also stated to have have pastures by the hybrid in The Plan. Scorpia: seen in Razor from orbit and on the ground in Kendra Shaw's flashbacks. Looked decidedly Earth-like in both shots. Also stated to have jungles in The Plan. Picon: seen in The Plan from orbit and on the ground, oceans, harbors, blue sky, and clouds all depicted. Gemenon: seen from the ground at a spaceport in The Plan and depicted with a blue sky and clouds. Canceron: seen from orbit in The Plan with clouds, oceans, and stated by the hybrid to have beaches. Virgon: seen from the ground in The Plan complete with blue sky and clouds. It is also stated by the hybrid to have forests. Leonis: stated to have plains by the hybrid. There is a shot in The Plan which is strongly implied to be a ground shot of Leonis but it is more detached from other similar scenes as it doesn't exactly depict plains. It could be argued that it's actually another colony, such as Scorpia which is mentioned directly after in the same scene. But odds are it probably was meant to be Leonis. Aquaria: never seen. Stated to have oceans in The Plan. There's no reason to assume they're not oceans existing within a domed colony, but that possibility seems highly unlikely given the overall aesthetic of the show. Libran: seen for the first time from the ground only in The Plan. Courthouses shown. Since there's no orbital shot and the ground shot is dark and poorly lit, there's still a possibility that Libran was a domed colony. However, again, given the overall aesthetic of the show, this seems unlikely. Aerilon: never seen. Stated to have farms in The Plan, referred to repeatedly in the series as a farm colony, and a photo of a burning city on Aerilon all strongly imply that it was a habitable world. But again, there's no reason to assume all of this couldn't be contained within a domed structure, even if it's highly unlikely. Sagittaron: never seen. It thus has the best chance of not being a naturally habitable world. However, since all other colonies have evidence pointing them toward being habitable worlds, it's probable Sagittaron was meant to be considered one as well. A common response to this is why couldn't an advanced alien civilization (or "god") have recalibrated a star system in this fashion and left it that way for the Colonials to find? This is certainly a plausible explanation, if a gigantic leap. The principal issue with this explanation is that not once has any character on the show ever questioned how their highly improbable star system came to be. I know if I discovered a star system filled with twelve Earth-like planets, I'd want to know why it formed that way. A better rationalization is to say that the series bible and RDM's blog post is wrong; that the Twelve Colonies in fact are in separate star systems. We must call upon the writers of the spin-off Caprica to retcon the BSG series bible and establish in a subsequent episode of Caprica that the Twelve Colonies all exist within separate star systems for the sake of realism. Since the Colonials have access to FTL technology and the BSG series never explicitly discounts this possibility, it's still possible to rationalize. Let's all hope they recognize this hole and plug it for us! Update: Jane Espenson responded to the concerns in this article by writing to me on Twitter "we worked very hard with our tech advisor to get them in one star system. It's a star cluster, BTW, with some shared orbits, etc." This implies that the writers rationalized the problem by making the Twelve Colonies a multiple star system, though we still don't know precisely how many stars. The more stars the better though, for realism. I thank Ms. Espensen for the comment! Further clarification would certainly be appreciated though. Particularly, it would be nice to know precisely how many stars make up the Twelve Colonies and what each of the orbits looks like. Update 2: Jane Espenson and Kevin Grazier have revealed detailed information about the configuration of star system of the Twelve Colonies. The colonies are spread across four stars in a star cluster. Kevin, a JPL NASA scientist, claims that this star system configuration is "scientifically plausible." I certainly agree that they went to great lengths to rationalize the idea that twelve habitable planets could form in such close proximity, but to say that this configuration is scientifically plausible is stretching the truth a bit. We're still talking about an average of three habitable worlds orbiting each star; a staggeringly improbable idea. To be clear, strictly speaking I do agree with Kevin's claim. It is plausible, but only once you acknowledge the extreme odds against a star system forming this way. So yes, it is a plausible, if overly optimistic configuration. As such, my claim in this article as originally written still stands. The nature of the Twelve Colonies is amazingly improbable.